More than 500 titles, newspapers, newsletters, magazines, journals and academic periodicals with a predominantly Australian focus, are held in the Library’s serials collection. The collection provides primary source material and unique snapshots of events and campaigns, often poorly recorded, that affected a wide range of women’s issues. The newsletters and newspapers published by the grass roots women’s liberation movements of the 1970s, including Sydney Women’s Liberation Newsletter, Mejane and Mabel reveal the many struggles of women pressing for change. Less frequent publications, for example Refractory Girl: a women’s studies journal and Scarlet Woman, a socialist feminist magazine which was initially published quarterly, with the Sydney and Melbourne collectives responsible for alternate issues, would often carry related articles in successive issues about the triggers and responses that incrementally shaped campaigns. The collection reveals that concerns beyond the primary focus of women’s collectives, including haphazard funding and a scarcity of volunteers, often influenced how groups evolved. These issues also contributed to the complexities of the newsletters that they published. It was not uncommon for an organisation to amend its name or that of its newsletter, together with place of publication, format and frequency as the perspectives and resources of its leadership or membership changed. The Sydney-based Women’s Abortion Action Campaign (WAAC), one of Australia’s oldest still active women’s liberation organisations, did not change the name and focus of its publication Abortion is a woman’s right to choose, (1973- 1981) to Right to Choose: a women’s health action magazine (1981-1992) because its eight year campaign for the repeal of abortion legislation and freely available safe contraception ended. 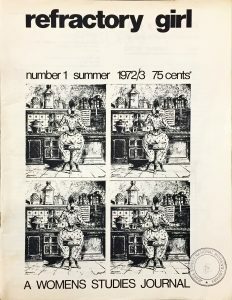 Rather, with the cessation of funding for allied groups (the Women’s Health Centre and Family Planning Association), WAAC had decided to ‘get together [and] pool … resources’ to continue the magazine as a ‘forum for dialogue on all women’s issues’ (21, 1981). The publication’s early broadsheet layout on poor quality paper suggests WAAC’s initial focus was everyday campaigning rather than creating a valuable historical record of struggle. Moreover, the decision to expand the magazine’s scope revealed a mature far-sighted membership stepping up to have a voice on an increasing range of women’s issues for the longer term. The Library’s serials collection reflects the diversity of women’s lives, history, creativity and achievements in its breadth and wealth of content. The Library has a continuing commitment to this substantial and specialised collection and, in keeping with its mission, it seeks to fill gaps in its holdings of serials to focus on unique aspects of women’s lives.